Almost three quarters of a century ago, my mother placed a message in a bottle and tossed it out beyond the waves. It bobbed along through tides, storms, and squalls until just recently, almost four decades after her death, it washed ashore at my feet. I’m speaking metaphorically, of course. Still, what happened, even stripped of the metaphors, does astonish me. So here, on the day after my 71st birthday, is a little story about a bottle, a message, time, war (American-style), my mom, and me. Recently, based on a Google search, a woman emailed me at the website I run, TomDispatch, about a 1942 sketch by Irma Selz that she had purchased at an estate sale in Seattle. Did it, she wanted to know, have any value? Now, Irma Selz was my mother and I answered that, to the best of my knowledge, the drawing she had purchased didn’t have much monetary value, but that in her moment in New York City — we’re talking the 1940s — my mom was a figure. She was known in the gossip columns of the time as “New York’s girl caricaturist.” Professionally, she kept her maiden name, Selz, not the most common gesture in that long-gone era and a world of cartoonists and illustrators that was stunningly male. From the 1930s through the 1940s, she drew theatrical caricatures for just about every paper in town: the Herald Tribune, the New York Times, the Journal-American,PM, the Daily News, the Brooklyn Eagle, not to speak of King Features Syndicate. She did regular “profile” illustrations for the New Yorker and her work appeared in magazines like Cue, Glamour, Town & Country, and the American Mercury. In the 1950s, she drew political caricatures for the New York Post when it was a liberal rag, not a Murdoch-owned right-wing one. Faces were her thing; in truth, her obsession. By the time I made it to the breakfast table most mornings, she would have taken pencil or pen to the photos of newsmakers on the front page of the New York Times and retouched the faces. In restaurants, other diners would remind her of stock characters — butlers, maids, vamps, detectives — in the Broadway plays she had once drawn professionally. Extracting a pen from her purse, she would promptly begin sketching those faces on the tablecloth (and in those days, restaurants you took kids to didn’t have paper tablecloths and plenty of crayons). I remember this, of course, not for the remarkable mini-caricatures that resulted, but for the embarrassment it caused the young Tom Engelhardt. Today, I would give my right arm to possess those sketches-on-cloth. In her old age, walking on the beach, my mother would pick up stones, see in their discolorations and indentations the same set of faces, and ink them in, leaving me all these years later with boxes of fading stone butlers. She lived in a hard-drinking, hard-smoking world of cartoonists, publicists, journalists, and theatrical types (which is why when “Mad Men” first appeared on TV and no character ever seemed to lack a drink or cigarette, it felt so familiar to me). I can still remember the parties at our house, the liquor consumed, and at perhaps the age of seven or eight, having Irwin Hasen, the creator of Dondi, a now-largely-forgotten comic strip about a World War II-era Italian orphan, sit by my bedside just before lights-out. There, he drew his character for me on tracing paper, while a party revved up downstairs. This was just the way life was for me. It was, as far as I knew, how everyone grew up. And so my mother’s occupation and her preoccupations weren’t something I spent much time thinking about. I would arrive home, schoolbag in hand, and find her at her easel — where else did mothers stay? — sketching under the skylight that was a unique attribute of the New York apartment we rented all those years. As a result, to my eternal regret I doubt that, even as an adult, I ever asked her anything about her world or how she got there, or why she left her birth city of Chicago and came to New York, or what drove her, or how she ever became who and what she was. As I’m afraid is often true with parents, it’s only after their deaths, only after the answers are long gone, that the questions begin to pile up. She was clearly driven to draw from her earliest years. I still have her childhood souvenir album, including what must be her first professionally published cartoon. She was 16 and it was part of an April 1924 strip called “Harold Teen” in the Chicago Daily Tribune, evidently about a young flapper and her boyfriend. Its central panel displayed possible hairdos (“bobs”) for the flapper, including “the mop,” “the pineapple bob,” and the “Buster Brown bob.” A little note under it says, “from sketches by Irma Madelon Selz.” (“Madelon” was not the way her middle name was spelled, but it was the spelling she always loved.) She would later go on to do theatrical sketches and cartoons for the Tribune before heading for New York. I still have her accounts book, too, and it’s sad to see what she got paid, freelance job by freelance job, in the war years and beyond by major publications. This helps explain why, in what for so many Americans were the Golden Fifties — a period when my father was sometimes unemployed — the arguments after I was officially “asleep” (but of course listening closely) were so fierce, even violent, over the bills, the debts, and how to pay for what “Tommy” needed. But other than such memories and the random things my mother told me, I know so much less than I would like to about her. As I turn 71 — two years older than my mother when she died — I can’t tell you how moved I was to have a small vestige of her life from the wartime moments before my birth wash ashore. What my correspondent had bought in that estate sale — she later sent me a photo of it — was a quick portrait my mother did of a young man in uniform evidently being trained at the U.S. Coast Guard Machine School on Ellis Island (then occupied by that service). On it, my mother had written, “Stage Door Canteen” and signed it, as she did all her work, “Selz.” It was April 1942, the month of the Bataan Death March and Doolittle’s Raid on Tokyo. And perhaps that Coast Guardsman was soon to head to war. He signed my mother’s sketch “To Jean with all my love, Les” and sent it to his sweetheart or wife. ”Les” sketched by my mother at the Stage Door Canteen on April 20, 1942. That institution, run by the American Theater Wing, first opened in the basement of a Broadway theater in New York City in March 1942. It was a cafeteria, dance hall, and nightclub all rolled into one, where servicemen could eat, listen to bands, and relax — for free — and be served or entertained by theatrical types, including celebrities of the era. It was a hit and similar canteens would soon open in other U.S. cities (and finally in Paris and London as well). It was just one of so many ways in which home-front Americans from every walk of life tried to support the war effort. In that sense, World War II in the United States was distinctly a people’s war and experienced as such. My mother did her part. I’m sure it never occurred to her to do otherwise. It was the time of Rosie the Riveter and so Irma the Caricaturist lent a hand. 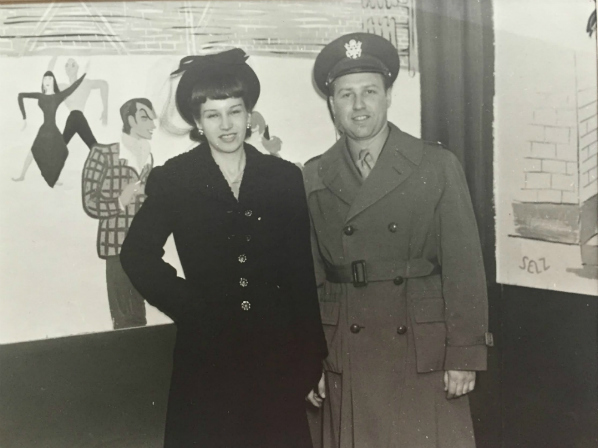 My mother and father in front of a mural she painted for the Stage Door Canteen. Imagine then that, on the April night when she drew Les, that “lady” might also have sketched another 100 or more soldiers and sailors, mementos to be sent home to family or sweethearts. These were, of course, portraits of men on their way to war. Some of those sketched were undoubtedly killed. Many of the drawings must be long gone, but a few perhaps still cherished and others heading for estate sales as the last of the World War II generation, that mobilized citizenry of wartime America, finally dies off. I still have four of those “scrap-books.” To my mind, they are small classics of mobilized wartime effort at the most personal level imaginable. One, for instance, included — since she was pregnant at the time — a double-page spread she illustrated of the future “me.” The first page was labeled “My daughter” and showed a little blond girl in a t-shirt and slacks with a baseball bat over her shoulder. (My mother had indeed broken her nose playing catcher in a youthful softball game.) The other is labeled “Your daughter” and shows a pink-cheeked blond girl with a giant pink bow in her curly hair, a frilly pink dress, and pink ballet slippers. Inside one of those little magazines, there was even a tiny slip-out booklet on tracing paper labeled “A Pocket Guild to SELZ.” (“For use of military personnel only. Prepared by Special Service Division, Eastern Representative, Special Project 9, Washington, D.C.”) It began: “If you start worrying about what goes with Selz, here is your reference and pocket guide for any time of the day or night.” Each tiny page was a quick sketch, the first showing her unhappily asleep (“9. A.M.”), dreaming of enemy planes, one of which, in the second sketch (“10 A.M.”), goes down in flames as she smiles in her sleep. The micro-booklet ended with a sketch of her drawing a sailor at the Merchant Seaman’s Club and then, in front of the door of the Stage Door Canteen, heading for home (“11:30 P.M.”). “And so to bed” is the last line. The cover of one of my mother’s “scrap-books” sent to my father at war. For both of them, World War II was their moment of volunteerism. From 1946 on, I doubt my parents ever again volunteered for anything. Here’s the strange thing: the wars never ended, but the voluntarism did. 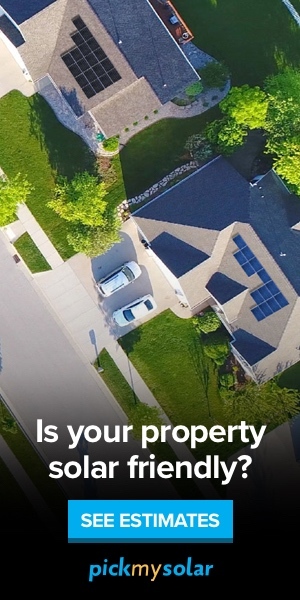 Think of it this way: there were two forces of note on the home front in World War II, an early version of what, in future years, would become the national security state and the American people. The militarized state that produced a global triumph in 1945 emerged from that war emboldened and empowered. From that moment to the present — whether you’re talking about the Pentagon, the military-industrial complex, the intelligence services, private contractors, special operations forces, or the Department of Homeland Security and the homeland-industrial complex that grew up around it post-9/11 — it’s been good times all the way. In those seven decades, the national security state never stopped expanding, its power on the rise, its budgets ever larger, and democratic oversight weakening by the decade. In that same period, the American people, demobilized after World War II, never truly mobilized again despite the endless wars to come. The only exceptions might be in the Vietnam years and again in the brief period before the 2003 invasion of Iraq when massive numbers of Americans did mobilize, going voluntarily into opposition to yet one more conflict in a distant land. And yet if its “victory weapon” robbed the planet of the ability to fight World War III and emerge intact, war and military action seemed never to cease on “the peripheries.” It was there, in the Cold War years, that the U.S. confronted the Soviet Union or insurgencies and independence movements of many sorts in covert as well as open war. (Korea, Tibet, the Bay of Pigs and the Cuban Missile Crisis, Vietnam, Laos, Cambodia, Afghanistan, Lebanon, and Libya, to name just the obvious ones.) After the Soviet Union disappeared in 1991, the wars, conflicts, and military actions only seemed to increase — Panama, Grenada, Somalia, Haiti, Bosnia and Kosovo, Iraq (and Iraq again and yet again), Afghanistan (again), Pakistan, Libya (again), Yemen, and so on. And that doesn’t even cover covert semi-war operations against Nicaragua in the 1980s and Iran since 1979, to name just two countries. In the wake of World War II, wartime — whether as a “cold war” or a “war on terror” — became the only time in Washington. And yet, as the American military and the CIA were loosed in a bevy of ways, there was ever less for Americans to do and just about nothing for American civilians to volunteer for (except, of course, in the post-9/11 years, the ritualistic thanking of the troops). After Vietnam, there wouldn’t even be a citizens’ army that it was your duty to serve in. 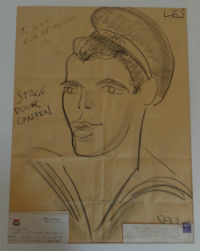 My mother draws a soldier on the set of the movie The Stage Door Canteen. In other words, when it comes to war, American-style, the 73 years since Irma Selz sketched that jaunty young Coast Guardsman at the Stage Door Canteen might as well be a millennium. Naturally enough, I’m nostalgic when it comes to my mother’s life. There is, however, no reason to be nostalgic about the war she and my father mobilized for. It was cataclysmic beyond imagining. It destroyed significant parts of the planet. It involved cruelty on all sides and on an industrial scale — from genocide to the mass firebombing of cities — that was and undoubtedly will remain unmatched in history. Given the war’s final weapon that took out Hiroshima and Nagasaki, such a war could never be fought again, not at least without destroying humanity and a habitable planet. Nonetheless, something was lost when that war effort evaporated, when war became the property of the imperial state. My mother died in 1977, my father on Pearl Harbor Day 1983. They and their urge to volunteer no longer have a place in the world of 2015. When I try to imagine Irma Selz today, in the context of America’s new wartime and its endless wars, conflicts, raids, and air assassination campaigns, I think of her drawing drones (or their operators) or having to visit a Special Operations version of a Stage Door Canteen so secret that no normal American could even know it existed. I imagine her sketching soldiers in units so “elite” that they probably wouldn’t even be allowed to send their portraits home to lovers or wives. In these decades, we’ve gone from an American version of people’s war and national mobilization to people-less wars and a demobilized populace. War has remained a constant, but we have not and in our new 1% democracy, that’s a loss. Given that, I want to offer one small cheer, however belatedly, for Irma the Caricaturist. She mattered and she’s missed.